For every angling occasion there is a wide range of knots to choose from. Knowing which knot to use and when is an indispensible skill which every angler should master. KNOTS FOR HOOKS, SWIVELS, SPINNERS, ETC. Thirty years ago you might have seen an angler attaching a hook with deceptive ease. He would have been using cotton, silk or flax lines with a short gut cast. A clove hitch in-rope or yarn can be quite loose but, strained, it tightens upon itself and holds fast. Nylon lines are far more elastic, flexible and slippery than the older fibres and an untightened nylon knot, especially if not designed for this material, will begin to slip as soon as strain is exerted upon it. With the advent of nylon monofilament and braided lines, many anglers had trouble with knots coming adrift, but the manufacturers soon designed several basic knots and loops for attaching hooks, for interconnections and for joining two lines of different thickness (with or without droppers). Anglers played some part in developing and making up knots for this exciting new material and now hardly anything else is used for fishing lines. For each occasion there is a choice of knot. The angler selects not merely for strength but also for ease of tying at a particular moment. For example, towards evening, in half-light, you could still manage a tucked half blood or a blood bight but might hesitate to try a two-circle turle or a dropper knot. In considering the knot-strength it is also essential to take account of the difference between the dry breaking strain of the line quoted by the manufacturer and the actual, wet breaking strain (b.s.) of the nylon in water. Something like a 10 per cent loss should be allowed for and since the knot is the weakest link in the tackle, the number of knots should be the fewest possible. The specimen hunter prefers to have only one such weak link. He slips floats, shots and other attachments straight on to the reel line, fastening his hook at the bottom. Not for him the minor pleasure of catching small fish: he puts all his hopes on having the right bait in the right place at the right time so that when his big fish does take the bait the chances of loss are minimized. Match fishermen also have to come to terms with many-knotted tackle. They need to catch as manyfish as possible, big, small or indifferent, in the alloted time and swim. Should the day begin with small roach or bleak, ultra-fine float tackes may be needed but when a neighbour lands (or maybe loses) a 2lb bream, the match man must be prepared to switch tackles at a moment’s notice. In order not to waste valuable time, he usually carries a number of casts of different breaking strains and shotting, with floats for different purposes made up ready on his cast winders. These generally have a loop at the top: with a similar loop at the end of the reel-line, he can substitute the whole cast and be fishing again in minutes. 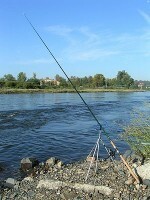 Anglers fishing in snag ridden waters will use several knots on the line. The main cast with floats and shots may be on 4lb line, but the final 18in of hook-line will be attached with 2lb or 3lb line. In the event of a bad obstruction on the bottom, only the hook line will be lost. The knots illustrated have now withstood the test of time and can be relied upon for all nylon lines, braided, twisted or monofilament. It is important to make them up properly and to give them a quick test before use, by holding the hook between finger and thumb and giving the nylon a sharp pull. The whipping that is illustrated deserves special mention because it is the traditional method used by sailors to whip rope ends but, provided at least five turns are made, it is completely reliable for nylon. It may look difficult but it is easier to tie than to describe or illustrate. A little practice with a piece of string whipped on a pencil stem will soon bring confidence. When using this whipping on a spade-end hook, nimble fingers and good eyesight are valuable assets. Early attempts should be tested by inserting the hook-point into a piece of wood and giving the free end of the line a couple of pulls. The water knot is a development of the double overhand loop. Instead of forming the knot on the bight of line to make a loop, it is made on the married shorter ends of the two lines to be fastened.